For 25 years the Vancouver international Jazz Festival has endowed the community and the international music scene with an unsurpassed level of creative music. Perhaps the most complete expression of this legacy was the meeting between Alexander von Schlippenbach and Barry Guy. The talents of these two unique individuals encompass the three characteristics of the classical definition of a musician: an artist with adept control of their instrument (chops), compositional accomplishment, and the ability to freely improvise. Both Schlippenbach (piano) and Guy (bass) are well known for their chops, compose and play in all contexts (solo, small group, and large ensemble), and are among the most knowledgeable and prospective improvisers on the planet. 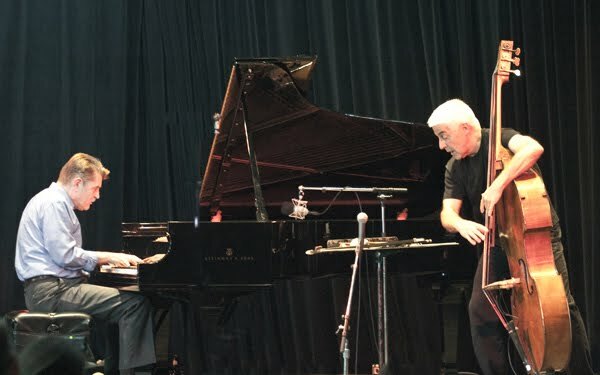 While this concert review discusses their duo concert, the Festival also featured the Schlippenbach Trio, the Globe Unity Orchestra, the Guy-Homberger Duo, and Guy's visionary collaboration with Michel Gagné, "Fixed Fragmented & Fluid." Anticipating the concert held specific appeal not because of the possibilities of hearing an encounter between masters of the genre. There were two other aspects. Firstly there would be the uniqueness of interplay between the instruments. Schlippenbach does not have a bass player in either Globe Unity or his Trio. Instead, Schlippenbach relies on his choices of extraordinary drummers to produce the sound's bottom end. Foreknowledge of this fact predisposes a listener to wonder how the two musicians would interact. The second specific appeal lay in the contrasting visual stage presence of the two musicians. Schlippenbach places little emphasis on showmanship. He's all piano with no Ellingtonian authoritative gestures or extraneous displays of emotion. The movements of his hands, the non-celerity of his feet approaching the pedals, his facial expressions as they flow with the music, his whole-state steadfastness, through all of these qualities one gets the impression of intellectual forethought, deliberation, and a concentrated summation of decades of music-making. His improvising methodology is akin to the strategic approach that Muhammed Ali took to boxing, his ideas fore-known but flexible enough to bend, warp, and invent as the universe of sound enveloping him demands where the music must go. Guy's stage persona is the anti-thesis of Schlippenbach's. Barry Guy is the most kinetic of musicians. From his bodily expressions, one can imagine the music he creates is an invisible other self, an ethereal being with whom Guy is dancing or even chasing. This is no accident, for Guy spent his early years working in the London creative dance milieu. This imaginary being is wholly independent of the double bass' human shape, the cinematic effect would be similar if Guy were manipulating a drum kit or when he is conducting an orchestra. He will move smoothly and delicately, rising and declining from his toes, then within a nano-second launch with surprisingly rapid and nearly violent accelerations into a series of slashing and pizzicato moves on his instrument. If music-making has any kinship to the martial arts, Barry Guy's improvising methodology is akin to the approach that Bruce Lee took to kung fu. What I saw and heard in this music was beyond the realm of the imaginable: magic, virtuosic displays of improvisory synchronicity, the creation of sound worlds parallel to the world of the human and natural world that is loaded with storms, clashes, intimate coherency, and full-scale beauty. The synchronicity came from the call and instantaneous response reactions, automatic shifting of gears that set up completely new modes of existence. Perhaps fifty percent of the concert contained prestissimo music-making, dazzling displays of acceleration and deceleration, totality of timbre between the two instruments, all of which left little time for a listener to hear the decay of notes overlapped as they were by the onslaught of the music. Equally, the responses included the interlude of silence, as happened after a rapid-fire exchange with Schlippenbach comping block chords (unusual in an improvisation) and Guy playing pizzicato. When Guy picked up his bow, Schlippenbach stayed silent for perhaps 20 seconds before beginning, astonishingly, a fast boogie-woogie style bass line for another 20 seconds that built into a Bud Powell-like right hand line (I make these comparisons only to suggest that these musicians are intimate with the entire history of the jazz idiom. Any allusion is fair game in the construct of musical coherency). The passage that left the greatest impression on me was when Guy and Schlippenbach held long spaces between the notes, a time when they played with romanticism that in turn led to the use of mallets. Schlippenbach keeps a large mallet in the bag he carries on-stage and Guy places his extra-bass instruments on a music stand set flat. It happened like this: Schlippenbach had just finished a beautiful line, which included the cross-hands technique. Guy was playing the deeper notes on the E-string. Their song had become as subdued as a summer breeze through a bamboo forest. They both rested their hands. The Schlippenbach reached into his bag for the mallet and played deep notes off the piano's strings inside the piano with great deliberation and percussed long tones that he permitted to reach their decay. The soundstage was ripe for possibilities and Guy chose to develop the music also using a small mallet. As he spun to reach for his mallet, he gave the E string a brief impulse and then began striking the strings above and below the bridge. That was Guy's right hand motion. With his left hand, he lightly gave a glissando touch on the strings and further manipulated the sound with his foot pedal. They were sounds that reached maturity before disappearing from our limited ears. While Alexander von Schlippenbach lay down his mallet and stated silence only for full half-minute, Barry Guy set up a discernible rhythm with mallet on his strings. When Schlippenbach returned to playing, they automatically shifted gears into a sprint. It was this run that carried them to the end of an incredible exposition of the art of improvisation.